Farmers have poured milk down the streets and stopped traffic on major highways as they protest price drops. 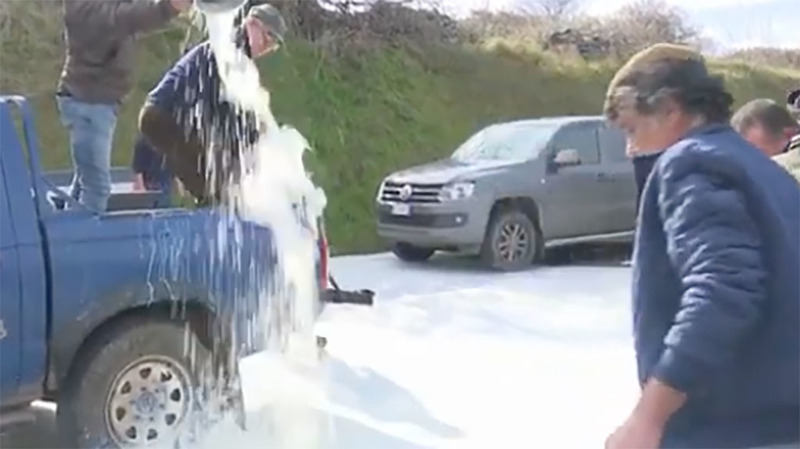 Sheep farmers in Italy were pouring milk in the streets in protest against falling prices saying they would rather destroy it than sell it at low prices. Videos posted online have shown farmers have pouring milk down the streets and blocked highways on the Italian island of Sardinia. According to EuroNews, the price has dropped more than 25 per cent to 60 cents per litre (53ppl) as the price of Pecorino Romano cheese fell. This was compared to 85 cents (75ppl) last year. Farmers were demanding prices were raised to €0.70 per litre at least. Much of the milk would go to production of Pecorino Romano cheese, which has recently fallen in price, leading to the milk price drop. Protesters also temporarily prevented local football team Cagliari from leaving their training ground to travel to the mainland for a match against AC Milan, letting them leave after they showed solidarity to the protesters. Players emptied urns of milk into the streets, in a compromise after farmers reportedly called for players to boycott the game in solidarity.